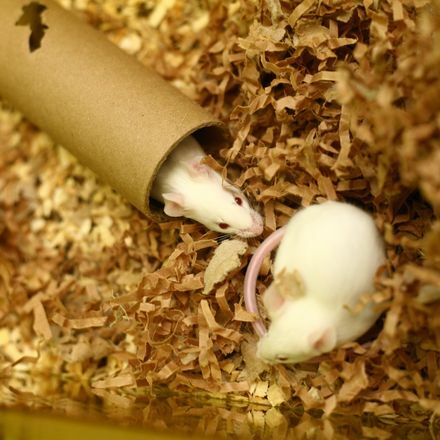 Setting the record straight: Environmental enrichment in animal research. One of the most important goals of Speaking of Research is to counter the misinformation and mistaken beliefs about animal research that are so prevalent in society, even among those who ought to know better, and a recent series of articles in Ampersand – the blog of the organization PRIM&R (Public Responsibility in Medicine & Research) – illustrates the value of taking the time to correct these errors when they occur. PRIM&R is an organization whose goals are to create a “a strong and vibrant community of ethics-minded research administration and oversight personnel, and providing educational and professional development opportunities that give that community the ongoing knowledge, support, and interaction it needs to raise the bar of research administration and oversight above regulatory compliance“. It’s membership includes over 4,000 individual members, and its educational and professional development programs address a range of issues surrounding research involving human subjects and animals. The regulatory mandate for environmental enrichment has a long history. In 1970, as a result of amendments to the Animal Welfare Act (AWA), enclosure standards for all warm-blooded animals were developed. The need for additional regulations became apparent in 1981 when Alex Pacheco, an animal rights activist and cofounder of the then-newly formed organization People for the Ethical Treatment of Animals, discovered and documented violations of the AWA as a volunteer at the Institute for Biological Research in Silver Spring, MD. Pacheco’s work drew public attention to the care of laboratory animals. Contrary to well established facts, the post implicitly maligned a distinguished member of the psychological science community (involved in the ‘Silver Spring Monkey case’), and lauded the less than honorable tactics of the individual associated with a group, People for the Ethical Treatment of Animals (PETA), that is publicly opposed to research with nonhuman animals. Furthermore, based on scant, if any, credible evidence, the blog post credited PETA for almost singlehandedly achieving changes to the Animal Welfare Act (AWA) that led to environmental enrichment requirements for research animals. Finally, circling back to the events described in the PRIM&R blog post, we note that not only was the researcher in question exonerated on all but one count of AWA violation by USDA, as well as the US judicial system, but three highly respected scientific organizations—the American Association for the Advancement of Science, the Society for Neuroscience, and the American Psychological Association—independently investigated the so-called ‘animal abuse’ and found his conduct to be beyond reproach. Furthermore, in light of the baseless accusations against the researcher, we believe it is incumbent upon PRIM&R, the premier organization in the continuing education of institutional animal care and use committees, to acknowledge the impact of this ethically and scientifically sound research with nonhuman primates on the rehabilitation of individuals recovering from strokes and spinal cord injuries. Mice in a research laboratory. Image courtesy of Understanding Animal Research. In the spirit of transparency and respectful dialog, PRIM&R has written this second post, which we believe is a more considered treatment of an important and complex issue. We thank Drs. Bennett and Panicker for their feedback and for prompting us to take this second look. What can we learn from this series of posts? Firstly, the first post shows how the myths and misrepresentations spread by animal rights organizations have become so pervasive that even many people who should know better take some of them for granted. This is something we have encountered time and again, and even many scientists who support the use of animals in research don’t appreciate just how high a proportion of the claims made by animal rights groups are pseudoscience. Secondly, the next two posts show how some (regrettably not all) people are willing to listen when presented with the facts, and how this can spur them to become better informed and reconsider their prior assumptions. This is why it is so important that scientists and supporters of scientific research who know the facts take the opportunity to engage with both specialist and general media to correct misapprehensions and misrepresentations.